A parallel issue that has slowly been gaining traction in Canadian health policy circles is palliative care. Recently, Minister of Health Rona Ambrose highlighted the need for high quality palliative care as a component of end of life care for the growing elderly population in Canada.4 Generally, Canadian palliative care programs are designed with the mainstream population in mind. Although there have been some efforts to accommodate the needs of other groups, existing programs typically do not serve the needs of marginalized populations such as the homeless and the vulnerably housed – groups perhaps the most in need of care. Studies show that over 50% of Toronto’s homeless population don’t have access to a family physician, and that many die without access to health care providers trained in end of life care1. What has been especially promising about the PEACH program is its commitment to providing its clients with the full spectrum of care, regardless of their location or disease trajectory. In relation to this goal, PEACH is expanding the context of palliative care from a solely hospital-based model to one that includes shelters. Often, people wish to receive end of life care in a familiar, comfortable environment.6 When providing patient-centered care to people who are homeless and vulnerably housed, addressing patient priorities with respect to how, when and where care is delivered is a particularly important and complicated consideration. To make this more possible, PEACH has developed partnerships with various palliative care centres across the city. Partners include the Temmy Latner Center for Palliative Care, the Kensington Hospice, the St. Michael’s Palliative Care Unit, Toronto Grace Centre and the Toronto Central Community Care Access Centre (CCAC). Another crucial aspect of PEACH’s approach is the interdisciplinary and collaborative way in which it delivers palliative care. Dosani explains, “I work alongside my teammate, Namrig Ahmed, an amazing RN, who works with me on the front lines, seeing patients. We do consults together. We are delivering palliative care the way it should [be delivered], in the best possible way, which is in an interdisciplinary fashion.” This inderdisciplinarity is an advantage in addressing the many institutional and systemic barriers that the homeless face when accessing health care services, especially palliative care. A recent study highlighted several key factors that must be addressed to increase access and better serve homeless patients who are terminally ill. These include improving interactions between the health care system and homeless individuals, training healthcare providers in how to treat homeless people with compassion and dignity, delivering patient-centered care, and ensuring that there are alternative models of health care delivery to better cater to the unique needs of the homeless population.4 PEACH has been actively addressing these issues in its program. Canada is the only G8 country without a national housing strategy, which is surprising for a nation that is so wealthy and that has declared a commitment to protecting and respecting human rights. 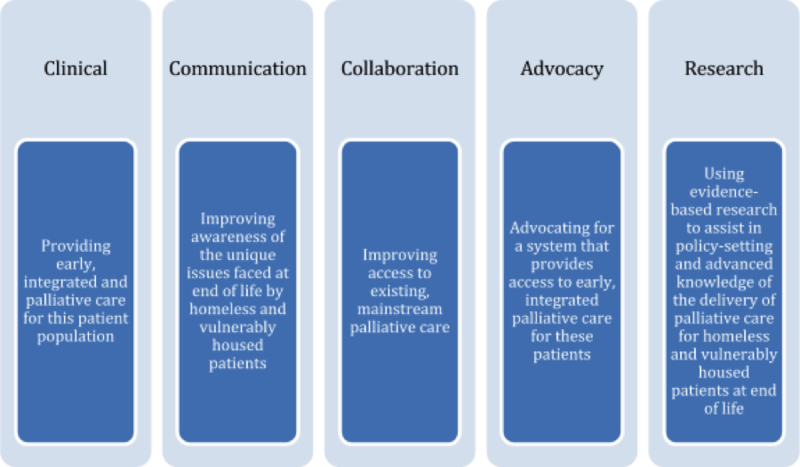 There is increasing discussion in federal policy circles about palliative care and homelessness, and it is the hope of many advocates that such discussions also focus on the intersection of these two very important issues. It is important to respect and protect the right to housing, health and health care for all people – especially vulnerable populations – and the least we can do in our society is to ensure that this right is protected not only during life but at the end of life as well. To learn more about PEACH, please write to peach@smh.ca and check out http://www.icha-toronto.ca/sites/peach. You can follow Naheed Dosani on Twitter at @NaheedD. Krakowsky, Y., Gofine, M., Brown, P., Danizer, J., & Knowles, H. (2012). Increasing Access – A Qualitative Study of Homelessness and Palliative Care in a Major Urban Center. American Journal of Hospice & Palliative Medicine, 30(3), 268-270. Temel, J.S., Greer, J.A., Muzikansky, A., Gallagher, E.R., Admane, S., Jackson, V.A., et al. (2010). Early palliative care for Patients with Metastatic Non-Small-Cell Lung Cancer. New England Journal of Medicine, 363, 733-742.